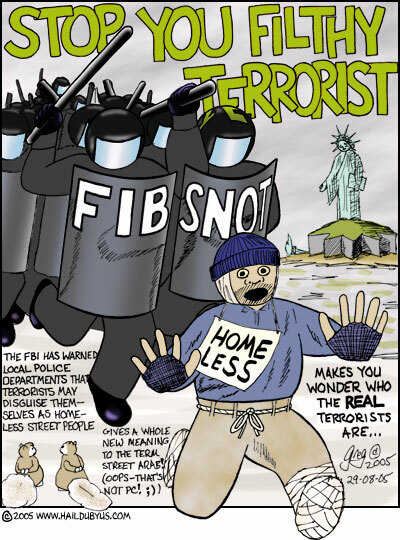 Being Homeless Is Unpatriotic–After All, You Can’t Be A Good Consumer | HAIL DUBYUS! Once again, the marginalized of society have been demonized in the paranoia so lovingly fostered by those who gain power from fear. However, an etymological note–homeless beggars were called street arabs, not as a pejorative against Arabs, but as a kind of simile. Because the poor have to clothe themselves in worn out clothing and will, especially in winter, wind multiple layers of scrap cloth around their bodies since they cannot afford to buy coats. The effect struck some people in the 18th/19th centuries as bearing a resemblance to Arab costume and the name stuck. I believe Kipfer is mistaken in referring it to a nomadic “wandering” through the streets–the visual is a much simpler and more direct idea.